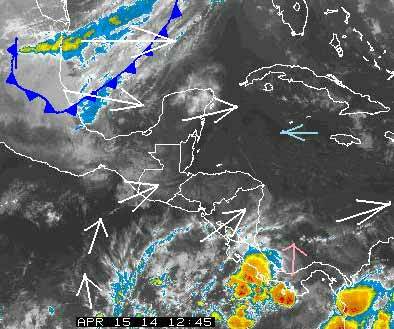 Belize NMS: A cold front approaches Yucatan later today and supports an increase in moisture and instability. 24-hour forecast: Sunny with a few cloudy spells today, there is a chance of an isolated thunderstorm inland or in the north this afternoon. Mostly clear skies tonight with little or no rainfall and sunny skies tomorrow with isolated showers and the chance of an isolated afternoon thunderstorm over the north or inland. Today: Winds: SE-E 5-15 kts. ; seas: Choppy. ; waves: 3-5 ft.; chance of an isolated afternoon thunderstorm in the north. Tomorrow: Winds: NE-N 5-15 kts. ; seas: Light chop - choppy. ; waves: 2-4 ft.; a few showers mostly south. Marine Outlook: Wednesday night:- Winds: NE'ly 5-15 kts. ; seas: Choppy. ; waves: 3-5 ft.; a few showers mostly south. General Outlook: For Wed. and Wed. night is for some cloudy spells with a few showers and isolated thunderstorms mostly over the south and along the coast. On Ambergris Caye this morning the wind has slowed to 8 mph from the ESE but the sea has not yet followed. Diving conditions are rough and this mornings activities are effected. Todays expected high is 90f. No rain on the Radar.. . . .. .That cold front has been descending down over Mexico since yesterday. It will have some influence, perhaps not a lot. .. .. .But another surge of ITCZ cloud spewing up north towards Belize. If these two conditions collide, then we might just get some rain, this evening.